A healthy diet is critical to the well-being of your box turtle. Box turtles are omnivores, eating both meat and plants. In the wild they consume berries and grass for plants, but you must provide a variety of healthful fruits and vegetables for your pet turtle. It's important to know which plants are poisonous to box turtles and to make sure your pet does not come into contact with them. Some plants or parts of plants are toxic to box turtles. They might cause mild irritation, damage organs, or even kill the turtle. For example, tomatoes are safe and they're often a favorite of box turtles. But tomato leaves and vines are toxic. Other plants toxic to box turtles include rhubarb leaves, holly, oleander, avocado leaves and seeds, and plants in the nightshade family. Some plants are poisonous to box turtles because their saps contain oxalate salts. If your turtle comes into contact with the sap, it will cause irritation including burning, pain and swelling. Some examples of plants that contain oxalate salts are begonia, calla lily and Boston ivy. Some plants trigger dermatitis or skin irritation. They can cause rash, itching or other irritation in box turtles. Plants that cause dermatitis include ivy, primrose, Shasta daisy, spider mum and plants in the buttercup family. 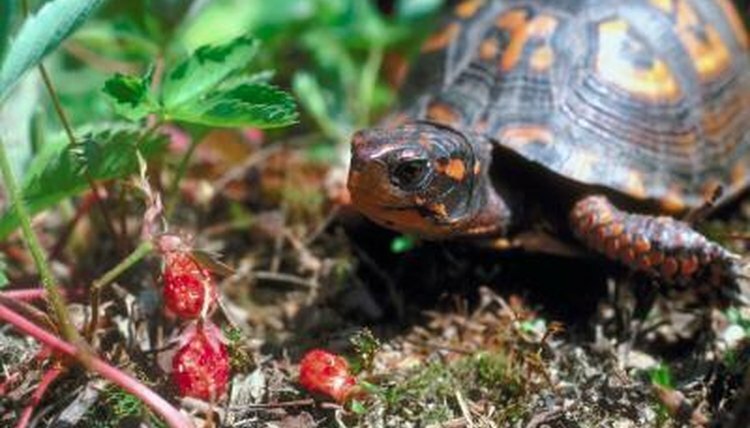 Some plants that might harm box turtles haven't been proven poisonous. These include gardenia, grape ivy and sweet pea seeds. If you aren't sure a plant is safe, it's best to keep it away from your box turtle. If your turtle has already come into contact with a poisonous plant or with a plant you're unsure of, contact your veterinarian to discuss symptoms and treatment.